Bologna is utterly famous for its fresh egg pasta, such as tagliatelle and tortellini. But there are three dishes equally rich and tasty that are often overlooked by the foreign visitors. Namely Passatelli, Zuppa Imperiale and Tagliolini in Brodo all of them are served in the famous capon broth that made Emilia famous for its food. Passatelli, Bologna style bread dumpling. Passatelli probably is a dish from the poor farmer culinary tradition. In fact they involve to use left overs such as stale old bread. It was a custom of the area to keep all uneaten bread in a bag and used it up for these poor dishes. To make passatelli you will need to make breadcrumbs and mix them with one egg, parmesan cheese until you form a moist dough. To season you can add a bit of salt, nutmeg and lemon rind! Once you have done so you will need to make “worm like” extrusions from the compound, this is usually done with a tool that resemble a potato ricer with bigger holes, if you do not have this you can use a grater with larger holes and literally grate the pasta you made. Cook the passatelli in your best broth and sprinkle with parmesan cheese. Enjoy. Zuppa imperiale, The imperial Soup of Bologna. Zuppa imperiale is one of the lost recipes of the Bolognese traditions and one of the most tasty ones. Mentioned by Pellegrino Artusi cookbook, the dish has ancient origins. The ingredients are simple: semolina, eggs, Parmesan cheese salt, lemon rind, nutmeg and butter. It is interesting that the semolina and the parmesan cheese are used in equal amounts. The trick is to obtain a soft and whipped compound that it is going to raise and become like a savoury sponge cake once baked in the oven. The cake should be golden and slightly crispy outside and soft and spongy inside in order to absorb the broth that it is going to be serve with. 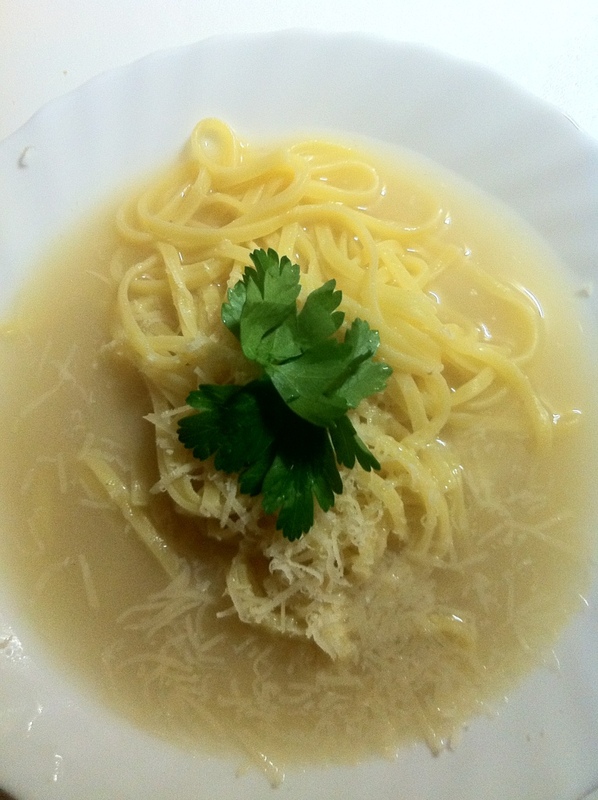 Tagliolini in brodo, Italian style noodles in chicken stock. People are often impressed by this dish due to the familiarity with Asian preparations such as Japanese ramen. Tagliollini are egg tagliatelle that have been cut very thinly, about a 3rd of the typical width. The stripes are simply cooked in the traditional capon broth and they should be eaten with a fork and spoon, probably the only pasta dishes that you are allowed to eat that way. The tagliolini in brodo sounds delicious. Something to warm us up here in the winter months.